This presentation contains gas (and a little oil) production from horizontal wells in the Marcellus (Pennsylvania), and the Utica (Ohio) basins, which I will call together “Appalachia”. Production until June 2016 is included, from 8215 horizontal wells that started production. This is the first time that I include production information from the state Ohio as well (since 2011), and I will continue reporting this state in the future. However, Ohio releases production information only once per quarter, so only once in 3 months will I present these results. Together the horizontal wells in these 2 states produced recently almost 25% of the total natural gas production in the U.S. (almost 18 BCF/d as you can see above, vs just over 72 BCF/d for the whole US) . If you “group production by” state, you can see the difference in production between these 2 states. You’ll see that gas production is much larger in Pennsylvania, while oil production is larger in Ohio (switch “product” to oil to see this). The formation in which a well has been drilled is not always clear in the data from these 2 states. In Pennsylvania, I take the simple assumption that all wells are in the Marcellus, while in Ohio I sometimes report the formations “Other” and “Unknown”.. I will give limited comments this time, and let the presentation speak for itself. One observation I’ll share is that the drilled, but uncompleted wells (“DUCs”) has been steadily falling since the beginning of 2015. You can see this in the “Well status” tab, when you select only “2. DUC”. One further note on the production in Ohio: In 2011 & 2012 only annual well production has been made available, and quarterly production per well ever since. I use an algorithm that divides this well production over individual months, according to a typical decline profile. The total production for each well matches exactly what Ohio reports for the full period, for each well. Next week Friday (Sep 16th), I plan to post another update on North Dakota. You can switch between different products (e.g. natural gas, or oil), by using the “Product” selection, present in all tabs. Note that filters & selections have to be set for each tab separately. Is there any way to know approximately where the DUCs are located in relation to the Marcellus sweet spots? Experience tells me that industry always high grades it’s acreage and prospects and drills & completes the best first. Some of these decisions surely were made for want of infrastructure but I wonder how productive or economic the remainingDUCs can be if the last wells to be completed are going to be the worst performing wells. After all, a DUC is really merely a hole in the ground. This shows the number of DUCs per county. Although it would appear (to me), from this overview, that the DUCs are mostly located in the sweet spot areas, I am not sure how good the correlation is between the location of a DUC, and its expected productivity. To clarify my above statement, I guess that the age of a DUC may also be highly correlated to its expected performance. The logic behind this is indeed as you say, that in general we would expect that the best DUCs get completed first. 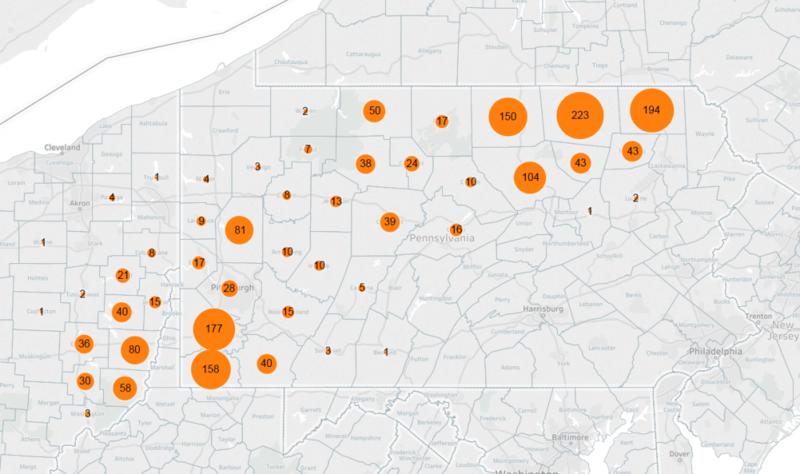 In recent months, the PA folks have introduced an array of online tools to assist in data presentation. The new interactive Gis map offers an unbelievable amount of data with just a few clicks of the mouse. HIGHLY recommended to first go to Youtube, search ‘pa dep oil and gas map tutorial’ and watch the ten minute tutorial. This mapping device is space age type stuff that has way more info than one can process. Until it is completed or abandoned that is. Do you know why 2011-2013 vintage’s seem to be increasing output versus 12 months ago? Is this something to look out for across basins and vintages moving forward, or something unique/unsustainable? I’ve tried to find what you mean, but I could not find it. You refer to the 2011-2013 vintages in the Marcellus, and you look at gas production? I don’t see a clear increase in gas production for those vintages during the last year. Note that if you group wells by “year of first flow”, that I recommend to ignore the tails of those vintages, as not all the wells in that vintage have reached that point in life yet. Enno, Just wondering why your numbers for the Marcellous PA side are off by about 3.62 million cf/day compared to EIA numbers for that month? Your numbers for most all other regions are very close to EIA’s numbers, with the exception of the Permian basin. I know it hard to get good numbers from TRC so this is most likely the reason for the discrepancy in this area. But with the Marcellous region, I would have thought the numbers would be a lot closer. I used your North Dakota tableau post, Permian Tableau post, Eagleford Tableau post and the Marcellous Tableau post, then set tableau to: Group production by “All”, Product “Gas” and for the Marcellous I set Basin to either “OH” or “PA”. Your numbers and the way you present them are still the best , they show the trend very well. But was just wondering why the Marcellous from the PA side is out so much. Is it the same reason as with the Permian with insufficient or hard to interrupt data? Good question, and I’ll add this to a FAQ I’m currently creating. 1. I don’t cover all states yet. For the Marcellus, the EIA includes West Virginia, while I do not include that state (yet). If you check the natural gas production only of Pennsylvania at the EIA (https://www.eia.gov/dnav/ng/ng_prod_sum_a_EPG0_VGM_mmcf_m.htm) you’ll see that our numbers get a lot closer. Similarly, for the Niobrara, I only currently cover Colorado, while the EIA includes the production from several neighboring states. 2. I only include the production from horizontal wells. Natural gas production in PA from conventional wells is still about 0.5 BCF/d. I don’t include this, but I think the EIA does. 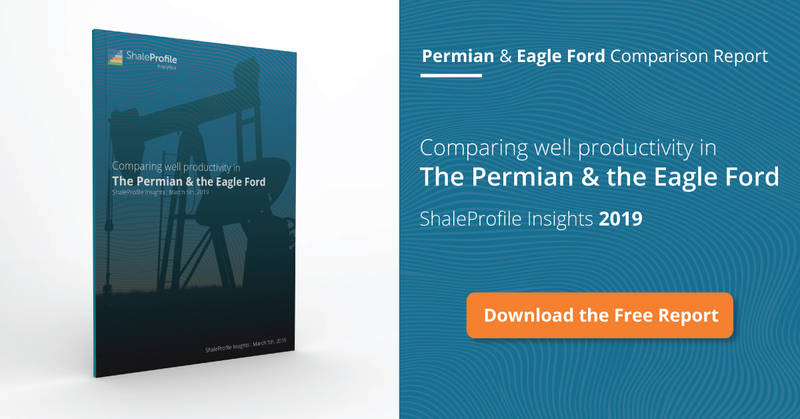 Similarly, a significant portion of the production in the Permian still comes from vertical wells, even a large portion of which have been frac’ed. I don’t include this production, as I think that focusing on the production from horizontal wells covers most unconventional shale production (the Permian is an outlier here), while providing a little better apples-to-apples comparison between the results of different areas/operators (despite significant differences between horizontal wells, completion techniques applied and costs). Thanks for checking this carefully, and I hope that the data I provide receives further scrutiny. Enno, thanks for the answer. So I just took a quick look at West Virgin gas production data, which they only release yearly, and that answers my question. In 2015 they produced 3.175 billion ft3/day from horizontals (must be almost all marcellous wells) and .500 billion ft3/day from verticals. Together that adds up to that missing 3.6 billion ft3/Day if it’s still producing that today. Again thanks for your work, it’s great. Cool, thanks for the confirmation Nodeywan.